Kate Just's The Texture of Her Skin opens this Thursday 31 May from 6-8pm at Glen Eira City Council Gallery, corner of Glen Eira & Hawthorn Roads, Caulfield. "The Texture of Her Skin presents a wide range of tools, faux archaeological relics, armours and knitted second-skins that translate a complex, overlapping, accruing sense oftouch, identity and belonging through skin. 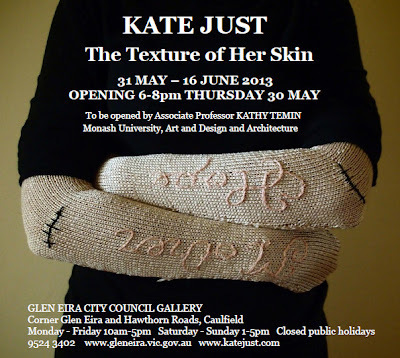 The exhibition is the culmination of Kate Just’s studio-led PhD at Monash University and comprises a major body of sculptural and installation works produced between 2010-2013 exploring skin’s relevance to subjective and multi-layered visions of the female body." The exhibition runs until 16 June.